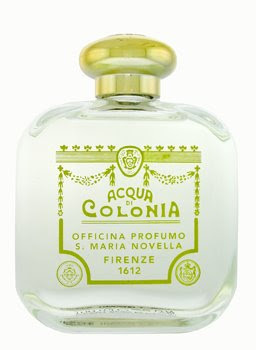 Behind the iron gates of 285 Lafayette Street in NYC lies a wonderful fragrance shop called Officina Profumo-Farmaceutica Santa Maria Novella. Better known as Santa Maria Novella. The mother company, located in Florence, Italy, is one of the oldest pharmacies in the world – founded in 1612. Here, perfumes and colognes are still made by hand and formulas have been passed down through generations. Walking into this shop is like taking a step back in time. If you're in New York, it's worth a visit. With it's long history and classic fragrances, Santa Maria Novella still strikes a very contemporary cord with scents that are uniquely clean and warm and very different from many of today's mass marketed fragrances. These colognes are complex, well made and long lasting. On a recent visit, I was drawn to one of their newer fragrances called Toscano which contains notes of bergamot, tobacco, vanilla, birch leaf and burnt malt. I'm not generally a fan of "tabacco" scents but this one is well rounded and comes across as more of a balance between all of the fragrance notes. A great scent for the winter months. thanks james. any reference to cocteau is fine with me! Jacek: I love it too although I'm not familiar with Cologne-Patchouli. I'll be sure to sample it when I go back. The people on your Christmas list must have been very happy. Barney: Thanks. I know what you mean. There are so many fragrances and have to admit that I haven't tried all of them. Not a fan of the medicine dry down. Which one was it? By the way, I'm watching the Golden Globes. Any thoughts on Drew Barrymore's look? Pretty amazing in that "two martinis away from rehab" look, but in a very chic and glamourous way.